Legoland: One Legoland Dr., Carlsbad, (760/918-5346) www.legoland.com This fun for all ages family attraction includes more than 50 super rides, shows and attractions including Fun Town Fire Academy, Coastersaurus, Lego Technic Test Track, Junior Driving School, Explore Village, Waterplay area and Funtown, Knight’s Kingdom, Block of Fame (a 3 dimensional art gallery for tots), Sky Patrol, Model Shop and Build & Test Room in the Imagination Zone. Newly opened, the cutting edge technology that enables guests to control the outcome of their adventure through the power of their hand gestures. Through 3D imagery, high-tech sensor and the use of hand movements in a striking motion, up to four riders per car can blast animated fireballs, lightning, shock-waves and ice as they travel through dojos to master their skills before heading into battle. Lego Hero Factory in the park’s Imagination Zone allows young guests to build and created their own Lego heroes or villains and meet and greet their favorite Hero Factory characters. Star Wars Miniland takes guests to a galaxy far away with six new live-action Lego displays of memorable scenes from the classic Star Wars movies. On May 26, the Water Park opens Splash Zoo, a brand new area just for toddlers. Age-appropriate amusements for the entire family. Legoland’s Pirate Shores features several water based attractions including Splash Battle, Treasure Falls, Swabbies Deck and Soak-N-Sail. The Shipwrecked theme continues at the park with special pirate themed entertainment and food offerings throughout the summer. This family friendly park is fun for all ages from toddlers to the young at heart. Reuben H. Fleet Science Center: Balboa Park, San Diego www.rhfleet.org Cellular Journey: Stem Cell and the Cells of the Human Body is a new permanent exhibit which emphasizes the importance of stem cells and their impact on medical research with interactive exhibits that educate visitors and allow them to simulate stem cell research procedures. 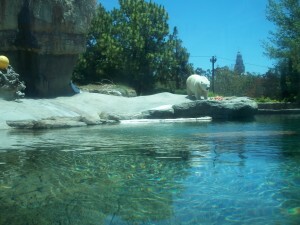 San Diego Zoo: Balboa Park (619/234-3153). One of the world’s greatest zoos. More than 3,000 animals, representing 500 specials live in and around the more than 128 acres of the zoo. Many of the wild animals live in surroundings which has been made to resemble their native habitats. San Diego Air & Space Museum: Balboa Park , San Diego www.sandiegoairandspace.org Space: A Journey to our Future highlights the history and future of space exploration ofering a look into the dreamers, thinkers and risk takers who dedicate their life to exploring the unknown. Thru Jan. 1, 2012. Sea World: 1720 South Shores Rd., San Diego (619/226-3929). Feed a 400-pound dolphin, watch a baby whale or get drenched by world-famous Shamu, the killer whale. From polar bears to penguins, Sea World guests experience animals from around the world. The biggest attraction at Sea World is Wild Arctic, an experience that takes guests to the top of the world Sea World, the world’s largest oceanarium, covers an area of more than 130 acres. This summer, Sea Turtle Bay will offer an up-close look at more than 60 threatened or endangered sea turtles and the threats they face in the wild. Wild Animal Park: 15500 San Pasqual Valley Rd., Escondido (619/234-6541.More than 2,400 animals roam this 1,800-acre spread which resembles Asian and African habitats. Many animals roam free while visitors view them from monorails and walkways.